Cuban MLB players who fled the island hope no one else has to. Will Trump and Rubio play ball? Like many before him, Rays outfielder Guillermo Heredia made the dangerous trek from Cuba to MLB. A deal to stop that could run into Trump’s hardline approach to the communist island. Months after the pact was reached, there’s no clarity. Just shy of his 24th birthday in January 2015, Guillermo Heredia Jr. stepped onto a boat with dreams of playing baseball in America. Heredia knew the risks he was taking. Three months earlier, eleven people had starved to death when their homemade vessel stalled in the treacherous Caribbean waters. Those who made it survived on rainwater, rationed out with syringes. But Cuba’s star outfielder could not turn back. His hometown club in Matanzas already suspended him on the suspicion he was defecting. The decision to leave was his, but drifting in the open waters, he no longer felt in control. He thought he may never see his dad and mom and sister again. Just 130 miles separate Cuba and Mexico — smaller than the width of the Florida peninsula — yet the journey lasted nearly two days and his angst grew palpable. “The smell of fear,” Heredia described it. Over the past three decades, dozens of Cuban baseball players have made the dangerous escape to play in the United States. If Major League Baseball gets its way, Heredia, now with the Tampa Bay Rays, will be one of the last to risk his life to play here. An historic three-year pact between Major League Baseball and Cuba announced in December could mean a faster and safer flow of Cuban stars to the big leagues. Current players especially have celebrated it as a humanitarian victory for the next generation. But the agreement’s future is already uncertain. It has become a political football in Washington, where President Donald Trump has ushered in a new era of hostility toward Cuba and its communist leadership. Three months in and a week before the new baseball season, there’s little clarity. Neither Major League Baseball nor the Trump administration would provide a straight answer on whether the three-year deal is currently in effect. Leading the charge to block it is U.S. Sen. Marco Rubio of Florida, a growing influence in the White House on Latin America policy and an opponent to any normalization of relations with Cuba as long as a Castro is in power. Cuban baseball players began migrating to the United States more frequently in the mid-1990s. Because of the Cold War-era trade embargo on Cuba, players had to establish residency in another country before a major league team could sign them. And because Cuban authorities guarded the coast against defections, leaving the island was often a harrowing journey. Yankees pitcher Orlando Hernandez ended up stranded on an island in Bahamian waters until the U.S. Coast Guard eventually found him. White Sox first baseman Jose Abreu ate his fake passport to evade Haitian authorities. Former Miami Marlins pitcher Jose Fernandez rescued his mother from drowning while crossing the Strait of Florida as a 15-year-old. Blue Jays slugger Kendrys Morales was repeatedly arrested until successfully defecting by raft on his eighth try. They come for a chance to compete against the best in the world and for a life-changing payday. Players in Cuba reportedly make about $20 a month. Major League Baseball, team owners, politicians and even fans turned a blind eye to their hardship for years. But attitudes changed in 2014 when Los Angeles Magazine published a bombshell expose on Dodgers outfielder and Cuban superstar Yasiel Puig. A national audience was introduced to another element of the escape: the smugglers who trafficked these players and extorted them for huge sums of cash. 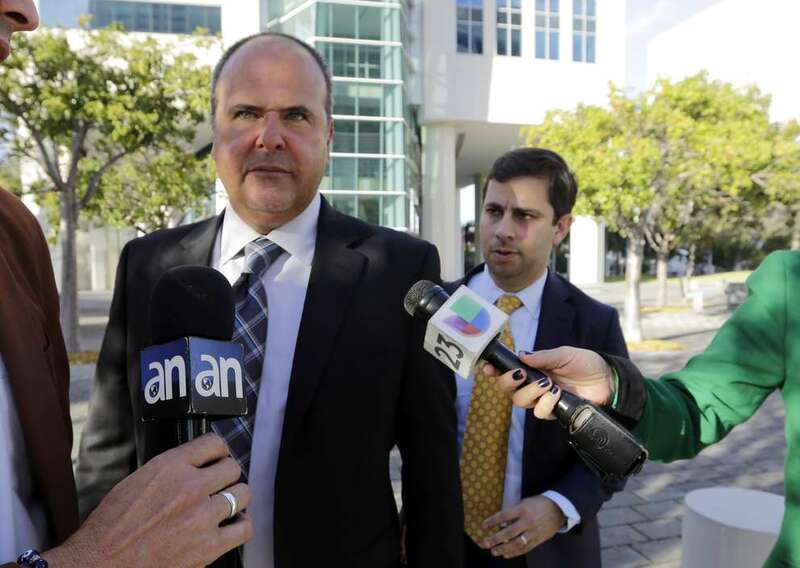 Two years later, a landmark conviction of two smugglers by a south Florida jury further exposed a lucrative world. One of the defendants pocketed $13.6 million helping two players leave the island, prosecutors said. Under this cloud, Major League Baseball initiated negotiations with the Cuban government. In the agreement reached last year, major league teams can sign Cuban players 25 and older and some younger players. In return, the teams must pay Cuba’s professional league, the Cuban Baseball Federation, a “release fee” equal to 15 to 20 percent of a major league contract. The players would report to the teams on work visas. The pact expires in October 2021, but both sides can agree to an extension. 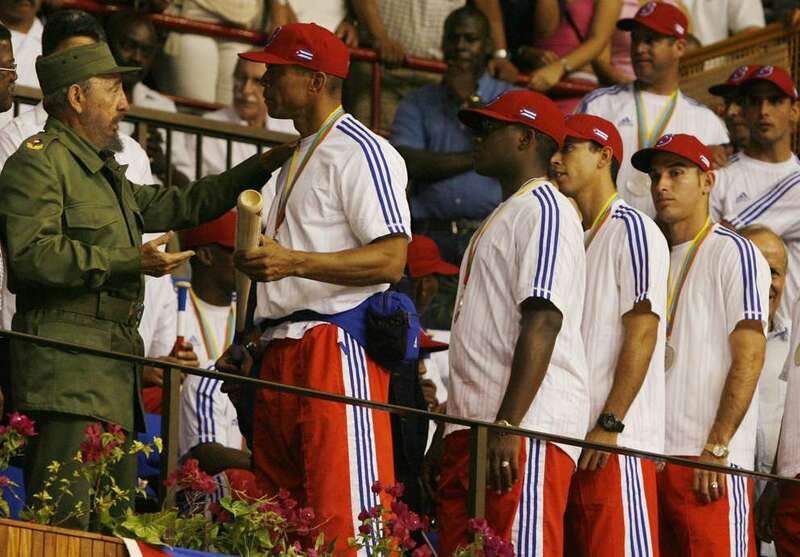 Cuba hardliners like Rubio especially object to paying the Cuban Baseball Federation for its players. Like everything else in Cuba, the baseball league is state-owned, and a portion of these multi-million dollar contracts will end up in the hands of an oppressive government, Rubio has argued. Rubio, the son of Cuban parents who emigrated before Fidel Castro took power, has consistently sided with south Florida exiles against any new business with the island. Rubio’s office wouldn’t make the senator available for comment. Nor would it say if the Florida Republican had an alternative proposal to prevent the dangerous trafficking of players. #Cuba holds baseball players hostage, but their suffering is our fault because we won’t legalize paying the ransom? Major League Baseball declined to respond to Rubio’s concerns. The league has compared its deal to those it has with Japan and South Korea. But the baseball agreement is political, said Ralph Fernandez, a Tampa lawyer and leader in Florida’s exile community. Sports and politics often intersect, like the Olympics at the height of the U.S.-Soviet struggle and the recent protests by black athletes against the criminal justice system. Fernandez, who has advised and mentored Cuban ballplayers, wishes Major League Baseball had demanded protection for players who speak out against their government. If Cuba retaliates against a player’s family, the deal should be off. The deal between Major League Baseball and Cuba was announced to much fanfare. But with the agreement’s fate now in the hands of the Trump administration, the commissioner’s office is treading cautiously. Neither Major League Baseball or the players’ union would talk about the deal. Teams, too, are reticent to speak. Asked if the deal was in effect, Major League Baseball spokesman Pat Courtney responded that the U.S. Treasury in 2016 issued the league a license “that permits us to move forward with the agreement.” He didn’t, however, say if they have. State Department spokeswoman Marlo Cross-Durrant said the agreement is under review and there is no timeline for a decision. The administration “will continue to take actions to support the human rights of the Cuban people and restrict the Cuban regime’s ability to benefit disproportionately from U.S. business at the expense of the Cuban people,” Cross-Durrant said. 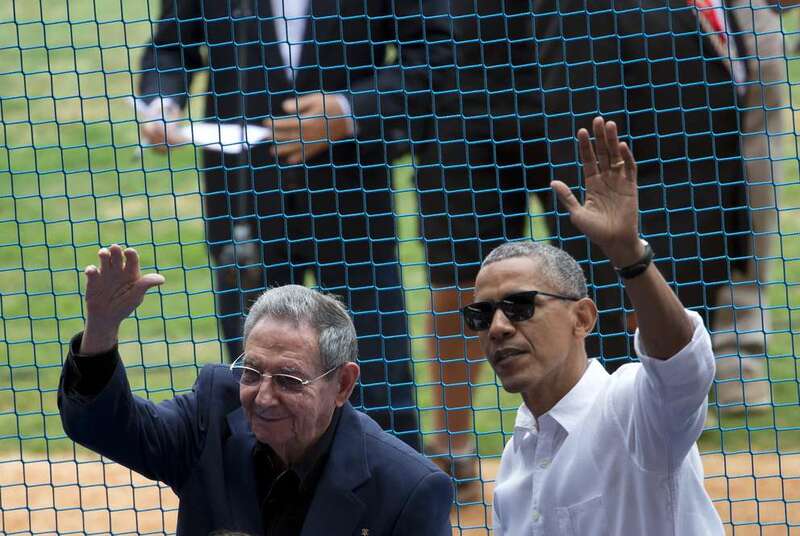 Soon after taking office, Trump reinstated some travel and trade restrictions eased by President Barack Obama, who famously attended a baseball game in Cuba alongside Raúl Castro. Recently, he opened the door for U.S. nationals to sue companies operating on land seized by the Cuban government after the revolution. And he has been encouraged to block the deal by Rubio and others, including Elliot Abrams, a neoconservative who has advised Republican presidents on Latin America policy since Ronald Reagan. Meanwhile, Cuba appears to be moving forward as planned. The Cuban Baseball Federation on March 31 will present Manfred with 10 to 15 players eligible for Major League Baseball contracts, said Ismael Sene, a Cuba baseball historian who hosts a weekly television program there. There are a handful of pitchers, a first baseman, a shortstop and a catcher playing in Japan who want to try the major leagues, he said. Speaking from his Havana home, Sene said the agreement is welcomed by everyday Cubans, who enjoy cheering on their local players against elite competition. But at the mention of Rubio, Sene grew so exasperated, his pneumonia flared up and he could not catch his breath long enough to continue the interview. There are other motivations for Cuba and Major League Baseball beyond the plight of the players. Blocked from scouting on the island, signing a Cuban player to a big league contract has been a leap of faith for teams, with a huge price tag if they swing and miss. Improved relations could mean better opportunities for early evaluation of players, said Blue Jays general manager Ross Atkins. The mass exodus of players to foreign leagues, poor economic conditions and the popularity of soccer have lead to a “staggering” decline in the quality of baseball in Cuba, said Kit Krieger, a long-time observer of Cuban baseball who leads expeditions to the island to watch games and tour landmarks. The agreement between Major League Baseball and Cuba would allow players to return unpunished and perhaps rejoin the national team and even play for local clubs during the offseason. Players are anxious to take advantage of that, Morales of the Blue Jays said through a translator. Times senior news researcher Caryn Baird contributed to this report. Contact Steve Contorno at [email protected]. Follow @scontorno.